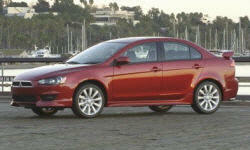 2013 Mitsubishi Lancer Pros and Cons: Why (Not) This Car? In recent years many compact cars have acquired the features and refinement historically reserved for their big brothers. While this has made them much more appealing to the average car buyer, what about someone who wants a good-performing car that communicates rather than insulates? Based on a week spent with a 2010 Lancer GTS a few years ago, I thought Mitsubishi (yes, they're still around) might continue to offer such a car. While the Lancer GT replaced the GTS last year, it's virtually the same car introduced back in 2008 (with the 2.4-liter engine following a year later). Mitsubishi has lacked the funds to develop a successor. But can an new old car ever make sense, even for someone who finds the latest cars overly cushy? I spent a week with a 2013 Lancer GT to find out. What to compare the Lancer to? Among competitors with similar specs, the Dodge Dart GT comes closest in price. Convex curve of the instrument panel resembles that in a BMW. Nothing else does. 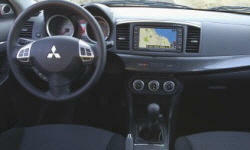 Why the 2013 Mitsubishi Lancer? The Mitsubishi Lancer GT is worth considering at all because its light, quick steering provides a more direct connection with the front tires' contact patches than you'll find elswhere in the current crop of compacts, with the exception of the soon-to-be-redesigned Mazda3. On the highway this steering can even feel a little too quick, but it inspires confidence when hustling the Lancer GT along a curvy road. You know exactly which way the front tires are pointing, and how much grip they have left in them. Pair this steering with a suspension that never deals out an unpleasant surprise (not even with the somewhat intrusive stability control deactivated), and the Lancer GT is a fun, easy car to drive near its limits. I wouldn't mind if the car's cornering were a little flatter and if its handling felt even sharper, but the tradeoff for moderately aggressive suspension tuning is a livable ride. The Dart's steering feels heavy and numb in comparison. Combine this steering with a significantly higher curb weight (3,297 vs. 2,933 lbs. ), and the Dodge, though also well-behaved, feels much less agile than the Mitsubishi. The Lancer never turned many heads, and now that its design is entering its seventh year it's not likely to turn any. But anyone who finds Hyundai's and Ford's latest designs overly busy will find the Lancer's exterior refreshingly clean and restrained, even with the Evo-like big grille added last year. The GT's standard 18-inch alloys, body kit, and wing spoiler provide a sportier look than you'll find elsewhere at a similar price. My favorite angle. Standard 18-inch wheels, body kit, and spoiler say GT. Controls look and feel cheap, but are easy to reach and operate. The big grille and wing spoiler promise thrilling performance. This isn't the 291-horsepower Evo or even the 237-horsepower Lancer Ralliart, though. With a 168-horsepower 2.4-liter engine, the Lancer GT isn't blazingly quick. But it's quicker than any other compact you can buy for the price, getting to 60 mph in about 7.5 seconds. The engine sounds a little raspy, but revs smoothly and energetically. The Dart GT's 184-horsepower 2.4-liter engine is stronger at high rpm, but the Lancer's powerplant is about equally torquey through the midrange and must wrestle with fewer pounds. Add it all up, and the Dodge isn't quite as quick. Its engine does sound better, though. Transmission differences are more likely to be a deciding factor. I tested the Dart GT with an automatic transmission. But the manual transmission in a Dart SXT Rallye driven last year was not pleasant, with long ropey shift throws and a clutch that engaged high off the floor. If the manual transmission in the Dart GT feels the same, it could be a deal-killer. The Lancer's manual transmission, with moderate throws and a somewhat vague feel, doesn't approach the ideal established by the Honda Civic Si's. But it's much closer than the Dart's, and wouldn't be a deal-killer in itself. Don't want a clutch? Then the Lancer GT's option is a CVT (continuously variable transmission). Many people don't like the slipping sensation when accelerating with a CVT, but this one can mimic a six-speed paddle-shifted automatic. For those who don't like a CVT and who don't want to fuss with the paddles, the Dart's conventional six-speed automatic will be preferable. Mitsubishi has a warranty similar to Hyundai's and Kia's. So most of the car is covered for 5 years, 60,000 miles while the first owner also has powertrain coverage for 10 years, 100,000 miles. Nearly every other manufacturer covers the basic car for 3/36 and the powertrain for 5/60. Why Not the 2013 Mitsubishi Lancer? Partly because Mitsubishi has had to rely heavily on incentives to sell outdated cars, and partly because people wonder if it'll be able to hang on much longer (if they realize it's still around at all), its brand image isn't the best. Personally, I don't expect Mitsubishi Motors to go away. If weak sales and financial losses could kill the company, or at least its American subsidiary, it would already be dead. If we were being very charitable toward the Lancer GT's interior, we'd call it basic. But any upscale impression delivered by the exterior vanishes the moment the tinny door is opened. Many interior parts seem downright cheap. Virtually all competitors, including the Dart, look and feel much nicer inside. Big grille borrowed from the ultra-high-performance Evo. Mitsubishi did improve the powertrain's EPA ratings a few years ago. But they're still only 22 mpg city, 31 highway. Even the portly Dart GT manages 23/33 with a manual transmission. Credit a sixth ratio the Lancer lacks. In my suburban driving, the trip computer regularly reported averages in the high 20s. Other compacts have done better in the same driving, but not by as wide a margin as the EPA numbers would suggest. You sit lower than in the Dart GT, yet the view forward from the Lancer's more comfortable and supportive driver seat is more open thanks to a lower, shallower instrument panel and thinner pillars. Good stuff. Unfortunately, the steering wheel tilts but does not telescope, and so is farther away than many drivers (including myself) would like. The view rearward from the Lancer GT's driver seat is far less open. Not only is the tail fairly high, but the wing spoiler bissects your rearward view. At times it obscures entire cars, at others it makes you think another car is right behind you when none is. One solution: get the Lancer GT in hatchback form--but then the CVT is mandatory. The Lancer has one of the roomiest rear seats of any compact. A Ford Focus has over three inches less total legroom, the Dart about an inch less. The rear seat is too low to the floor to provide adults with proper thight support, but this is common even in larger sedans. Back in 2008, the Lancer GT was about as quiet as the average compact sedan. Perhaps even a touch quieter than the average. So it's hardly loud inside. But some more recently designed compact sedans, especially the Dart, are much quieter. For a list price of $20,790, the Lancer GT includes a 2.4-liter engine, 18-inch wheels, body kit, leather-wrapped steering wheel, and supportive seats. The Dodge Dart GT checks in a significant $1,200 higher. BUT the Dodge has far more standard equipment, including heated leather seats (with the driver's power adjustable), a reconfigurable instrument display, a touchscreen infotainment interface, rearview camera, automatic headlights, auto-dimming rearview mirror...too much to list. Total it all up, and the Dart GT has over $3,500 in additional standard content. If you want these features enough to pay what they typically cost, then the Dodge is a much better value. This becomes clear if you option both cars with HID headlamps, heated leather seats, sunroof, and a premium audio system. On the Lancer GT, these features are only available in a $3,550 bundle. With them the Dart GT lists for $23,775, the Lancer GT for a not-so-competitive $24,340. And the Dodge still has about $1,600 in additional content. But if you don't care for such things, then the Lancer GT provides all of the driving-oriented essentials for the lowest starting price. And Mitsubishis rarely sell for anywhere near their list prices. Generous discounts and incentives (a choice between a $2,000 rebate and zero-percent financing for 60 months as I type this) will make the actual price significantly lower. The Mitsubishi Lancer GT hasn't sacrificed driver involvement in the pursuit of refinement and fuel economy. Largely for this reason, it's a fun car to drive and one I'd like to recommend. But even buyers who put a high priority on handling and a low one on luxury are likely to be turned off by the cheapness of the Lancer GT's interior, and perhaps by its EPA fuel economy ratings as well. A relatively low base price and relatively high incentives help compensate, but adjust for feature content and this price doesn't seem nearly as attractive. So, as much as I'd like to recommend this car, I find I can only do so to someone who really likes how it drives, who doesn't care about how cheap the interior looks, and who finds an unbeatable deal. 168 horsepower won't inspire any headlines, but enough to have fun. Could sound more exciting. Trunk space about average. Split folding rear seat. Mitsubishi and Dodge each provided an insured car for a week with a tank of gas. 2013 Mitsubishi Lancer pros and cons, according to Michael Karesh: the best reasons for buying (or not buying) the 2013 Mitsubishi Lancer. Join TrueDelta to post your own impressions.